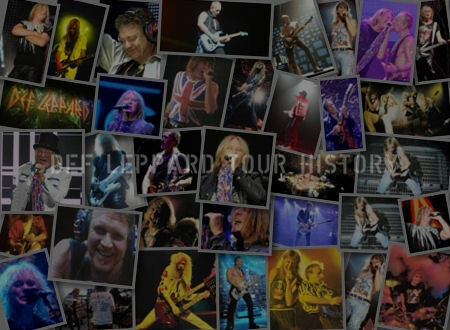 Def Leppard's classic Hysteria album entered the UK charts at Number One 30 years ago on this day in 1987. 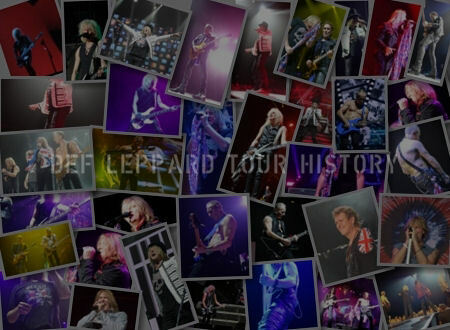 The band's fourth studio album had been released on 3rd August and went straight in at the top. It went on to spend 101 weeks on the chart up October 1992. This is often quoted as the total but it actually spent a further four weeks on the chart in 1994 taking it to 105 weeks in all. This was extended to 106 earlier this month with the release of the 30th anniversary edition. The album's success followed on from 'Animal' becoming the band's first ever Top Ten single anywhere in the world by reaching Number 6 earlier in the same month. In reaching the top of the UK charts 'Hysteria' had also become the first Number One album of the band's career. A feat that 'Pyromania' narrowly missed out on in 1983 in the USA. 'Pyromania' had peaked at Number 18 in the UK in March 1983 and spent just 8 weeks on the chart. 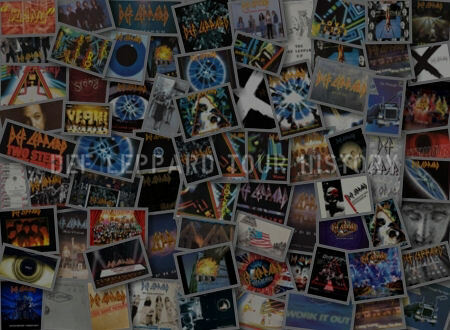 With 'High 'n' Dry' reaching only #26 after debut album 'On Through The Night' had made it to #15, their fourth album had taken the band to another level of success in their homeland and around the world. 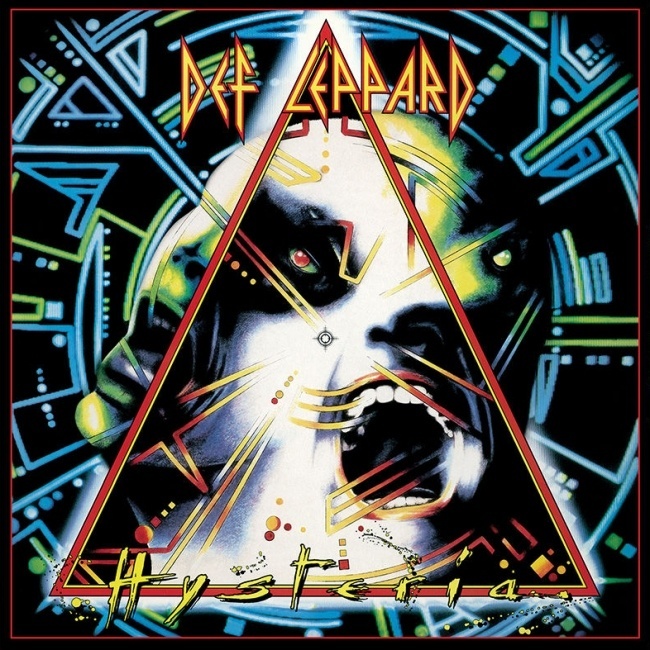 'Hysteria' would take another 49 weeks before the album reached Number One on the US Billboard Top 200 chart. On the same day the band were playing a second night in Belfast, Northern Ireland at Ulster Hall and were at their hotel when the received the news of the chart position. Joe injured his back halfway through the performance in another 'Hysteria' album related incident. How did it feel to have the European fans on your side? "It's great. It's been a long time. And we've always had that success the other side of the Atlantic. But it's just a question of, we never knew whether it was gonna happen in Europe. Because you can never gauge it, England, France, Germany. You never really know. And it's just great that it's actually coming right now." People thought you only cared about America? "I think that was quite a long time ago really. I think the last four or five years people have been realising that we're not - we never were like that anyway. We just basically try and make records that sound they way we want them to sound." "And it's not for any specific motive or for any particular territory. It just so happened that we did get well received in America with our first album. And it's like 8 years ago now. And it just went on from there. But I think people realise now that you just do it for genuine reasons." Well the new album Hysteria went straight into the charts in the UK at Number One. Was that a great surprise to the band? "Surprised. Shocked. We're still shocked. We still can't believe it to be quite honest. I mean to go in at Number One is great. But straight into the charts at Number One was just, it's unbelievable. We just never, never thought it would happen." "It was a tough one to follow and to be quite honest everybody knows we spent ages trying to follow the thing up. But we're happy with the new record. 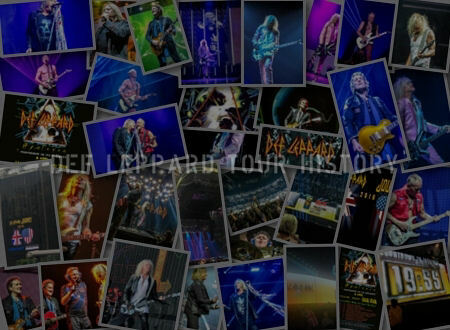 We think it's different enough, in a progressive way, but still keeping the Def Leppard sound. It's still got the guitars in there. We just wanted to vary it a little bit and we're really pleased with the way it came out." "I mean all the hard work we put into that. Trials and tribulations and everything that went off. You forgot about them the minute that we got the phone call at 8 O'clock in the morning saying your album's gone straight in at Number One in the British charts. It was like Whoaaah!. We were doing cartwheels down the hotel corridor." "Animal came out as a single and it was a hit. At last after ten years, ten years after we formed. We had our first British hit. And we got - I think number 6 it got to. And of course that was out about six weeks before the album or a month or so before the album. Which set the album up nicely. So it debuted at one which was great for us you know. We'd finally broke our home country after all this. 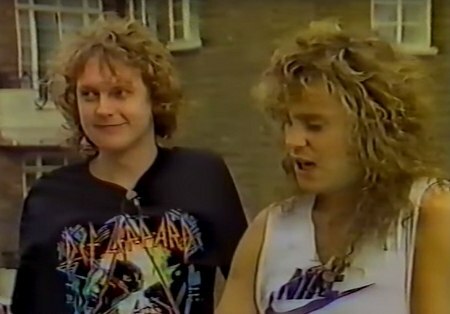 'Def Leppard aren't you an American band?'. "It was perfect. We all really, really liked it. I can't remember what we did as a band when we actually finished. But it was something special for all of us just to sit there and go ahhh...after I don't know how many years of recording. It was good." 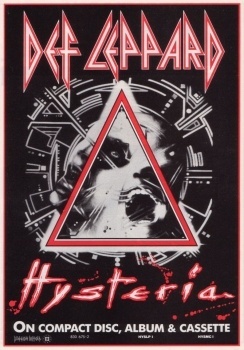 'Hysteria' replaced The Hits Album 6 at Number 1 and was displaced a week later by the same album and fell to Number 2. It then fell the Number 3 in the third week as The Hits Album 6 was at 2 with Michael Jackson's Bad a new entry at 1. The first time the two had been at the top of the album charts together since their sharing of the top two spots in the US Billboard chart during 1983.